Not content with saddling their daughter with a mouthful of a name like Millicent Marie (after a grumpy family member), Millicent Marie’s parents insist on calling her by that very same huge mouthful. Known to her school friends as Millie, Millicent Marie is grateful that she did not end up with a cool, arty, celebrity kid name like Organza. However, Millie decides that if she’d had a choice, her name would have been Amanda. Amanda has such a nice ring to it. When Millie begins a diary in which she signs her name as Amanda, little does she realize what a ten-year-old annoying younger brother (Douglas aka Doogle) can do to wreak even more havoc in her life. Doogle finds Millie’s diary on her computer and publishes it as a blog for the entire world to see. Amanda’s soul is suddenly laid bare and, amazingly, people love her. She becomes Springside Elementary’s most sought after sixth-grade mystery gossip and advice columnist. Can Millie keep up the pretense? And for how long can she do it before her cover is blown? This is a lovely read for tweens (and their parents!). Millie has the usual slightly disparaging attitude towards her prehistoric-age, totally embarrassing parents who (in the nature of all parents) seem to be incapable of treating her as the almost-adult she considers herself. Millie was given the choice of a computer or a cell phone when she turned twelve. Everyone knows that any self-respecting teenager needs both. Author Karen Pokras Toz captures Millie’s life angst—from disillusionment with sixth grade, to decisions about doing soccer or drama, to denying she has a crush on the utterly handsome Jordan Cowell—with humor and inside knowledge. I also enjoyed Millie’s coming of age and gradual maturing. As Amanda, Millie learns huge life lessons about friendship, respect, and the fact that other people have feelings and problems. As Millie, Millie learns about her identity and who she really is, and decides that she is happy being herself. Highly recommended. 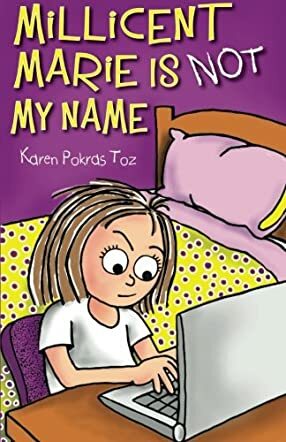 “Millicent Marie is Not My Name” by Karen Pokras Toz is a fun story, written for 4th – 6th Grade readers. The main character, 6th Grader Millicent Marie Harris, hates her name. She has always wanted a more exotic name, like “Amanda”. When she starts keeping a daily diary on her computer, she signs each entry with the name “Amanda”. But one day, her snoopy, pain-in-the-neck little brother reads her diary, and thinks it would be funny to post her diary as a blog, for the entire world to read. When Millie starts getting emails from people she doesn’t know, telling her how much they enjoy her blog, she quickly figures out who is to blame. But she finds she enjoys the notoriety, so she secretly continues the blog as an advice column for her elementary school. Something is bound to go wrong, though, and it does, at the worst possible moment. Will Millie ever be able to show her face at school again? Will her classmates ever forgive her? This story is a fun, clever tale with a timely moral, well-suited for the target age group. Millie, like many other kids, tries to keep a low profile, and avoid being noticed at school. Still, she gets picked on now and then by other girls who seem to enjoy making themselves look better by mocking the “flaws” of others. Once she begins to become a popular, if anonymous, persona, she begins “payback” by printing rumors about some of the bullies. Only when she is found out does she realize that she, too, has been a bully. She posts her final blog with a very good anti-bullying message, and is humbled when some of the targets of her gossip forgive her because she made them realize that they, too, had been bullies. I thought the ending was quite believable and appropriate, and is the icing on the cake of a very enjoyable little story. Parents, grandparents, and god-parents – I recommend you to get this book for your 4th through 6th grader to read and learn from. I am quite sure they will enjoy and appreciate it! Millicent Marie hates her name. When she starts an online diary, she signs her posts with the name she wishes she had, Amanda. Amanda means lovable, and doesn’t every girl want to be loved? When Millicent’s younger brother, Douglas, stumbles upon her online diary, he thinks it will be funny to set up a blog titled Behind the Scenes at Springside School and post his sister’s diary entries. Millicent is appalled when she discovers what her brother has done behind her back, but then she gets her first reply . . . and another . . . and another. What can it hurt to post another entry? Suddenly Millicent is the most popular girl at Springside — well, Amanda is, anyway. But everyone knows that popularity comes with a price, and that secrets and lies eventually come out of hiding. Karen Pokras Toz has created a story that will speak to many teen readers. It is a story about friendships, popularity, crushes, and the crazy things kids do in the pursuit of these things. Her characters are real and believable, though perhaps a bit too mature for their supposed ages. The main characters are sixth graders and the story’s content includes online blogging, bullying, dating, and drama club. Sounds more like junior high to me, but Ms. Toz keeps it appropriate for her younger readers. Millicent Marie has a great voice, and a great lesson to learn. The story wraps up into a neat little package, perfect for readers who love a happy ending. Though a bit predictable at times, "Millicent Marie" is a fast-paced, entertaining read!